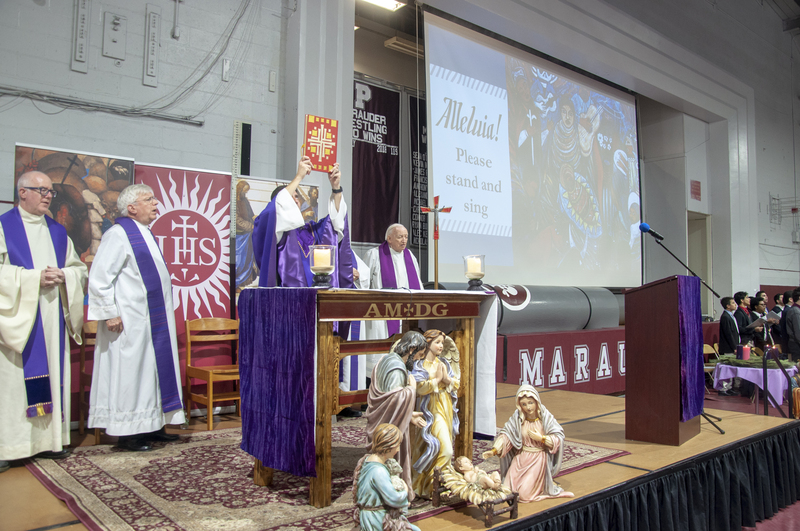 Before parting ways for the Christmas break, the Prep community gathered in the gym for an Advent Mass. Fr. Philip Florio, S.J., the vocations director for the Jesuits’ Maryland and USA Northeast Provinces, paid his first visit to Grand & Warren, and acted as guest celebrant. Fr. Florio reminded us that in all the signs that point to Christmas, even those that are simply festive in a secular manner, we can find the same great hope: seeing humankind suffering and lost, God reaches out to communicate with us in a manner we can understand – by becoming human through Jesus. But it’s a hope that comes with a challenge: “How will Jesus shine his light through you this year, this week, this day, next year?” Fr. Florio asked, reminding the community that we are tasked with bringing God’s love to those around us, during the Christmas season and all year long. Next: Next post: Christmas Greetings from Grand & Warren!